What to learn first - OO theory or database theory? How do you read from multiple tables? How do you write to multiple tables? The title of this article should not be news to any programmer who has been taught OO theory, and then tries to apply that theory when building a database application. The established view is that OO design is sacrosanct and that the persistence mechanism (ie. the database) is just a minor implementation detail that can be left till later. My view is completely the opposite - in any database application it is the database design which is sacrosanct, and the software is constructed to follow the database design. I do not make any attempt to hide the fact that I am talking to an SQL database, instead I embrace the fact and build my software specifically to take advantage of the power and flexibility of SQL. Go through the documented procedures which are outlined in Object Oriented Analysis and Design. Use mock objects to emulate the database before the physical database is actually constructed. When the software has been finalised get someone competent to design the database so that the mock objects can be replaced with real objects. Note that this uses a totally different design process known as Data Normalisation. Discover that the output of the two design processes are incompatible. This state of affairs is so common it has been given its own name - Object-Relational Impedance Mismatch. 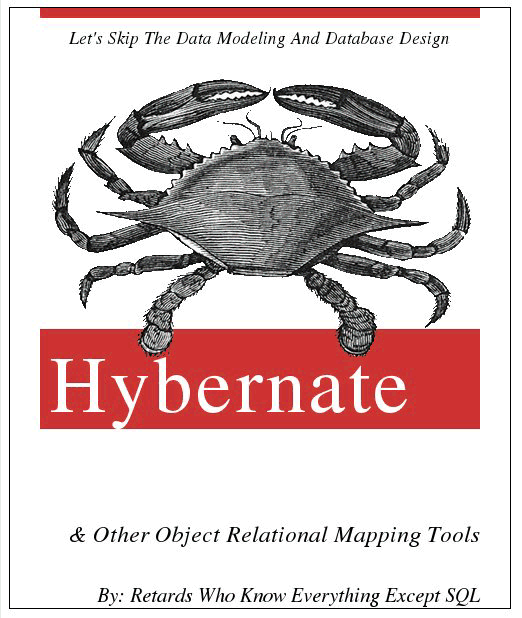 Employ a common solution to solve this problem, which is an abomination known as an Object Relational Mapper (ORM). Employ as many Design Patterns as possible as these were written by experts, and you want to be as good as those experts don't you? Employ all the proper OO principles as these were written by experts, and you want to be as good as those experts don't you? Start with the database design. Create a separate class for each database table. Use a development framework which was specifically designed to construct and run database applications. Run the framework to import the database structure into my Data Dictionary. Export the structure to generate a separate class file for each table. Generate user transactions by pairing a database table with one of my Transaction Patterns. Immediately run the generated transactions from the framework's customisable menu system. With my approach I can generate a family of forms for a database table in five minutes without having to write a single line of code - no PHP, no HTML, no SQL. Although the generated user transactions contain only basic functionality, it is very easy for developers to insert custom code into the generated classes in order to deal with complex business rules. Many years ago I remember someone saying in a newsgroup posting that Object Oriented Programming (OOP) was not suitable for database applications. As "evidence" he pointed out the fact that relational databases were not object oriented, that it was not possible to store objects in a database, and that it required the intervention of an Object Relational Mapper (ORM) to deal with the differences between the software structure and the database structure. I disagreed totally with this opinion for the simple reason that I had been using OOP to build database applications for several years, and I had encountered no such problems. As far as I was concerned it was not that OOP itself was not suitable for writing database applications, it was his approach to OOP - his method of implementing OO in his software - which was causing the problem. How do I have the audacity to say such a thing? It has become more and more obvious to me that too many proponents of OO seem to think that there is only one way to implement the concepts of OO, and that you should bend your software to adhere to these concepts rather than bending the concepts to allow for a more elegant or efficient solution. These people love to document their ideas as a series of guidelines, rules or principles, and they love to teach these rules to the next generation of software developers who then believe that these rules are the gospel truth, are cast in stone and cannot be questioned. Anyone who dares to question their beliefs, who dares to stray from the path of orthodoxy is liable to be branded as a heretic, an outcast, a pariah. Well I am a heretic, and proud of it. If you're a talented developer, you need to think outside the box. The box is there to prevent incompetent people from wrecking stuff. It's not for you. One common complaint I hear from developers who move from a non-OO to an OO language is that OO programs seem to be slow and cumbersome when compared with what they are used to. I think that the reason for this is that today's programmers are taught to blindly follow a bunch of principles instead of being taught to design and build cost effect solutions to genuine problems. This became obvious to me when I tried to debug someone else's code which used one of the popular front-end frameworks. I stepped through every line with my debugger looking for the cause of the error, but all I found was total confusion. All I had done was run through a single index page, but I had to step through 100 classes which had so many levels of indirection I did not have a clue as to which class did what. Anybody who thinks that using 100 classes to paint a simple index page is in serious need of a reality check. I was so disgusted with this framework that I immediately purged it from my system and refused to have anything more to do with it. My decades of prior experience told me that this was NOT the way that software should should be written, which is why I rail against those modern practices and principles which promote the writing of bad software. My critics, of whom there are many, constantly berate me for breaking their precious rules and daring to be different, but I don't care. If I were to do everything the same as them then I would be no better than them, and I'm afraid that their best is simply not good enough. They seem to think that by following their precious rules that my software will automatically be as good as it could be, but I maintain that by breaking their silly rules that my software is actually better than theirs. 1. The purpose of a software developer is to develop cost-effective software for the benefit of the paying customer, NOT to impress other developers with the cleverness of their code. Writing software that pleases the paying customers should always take priority over writing software that pleases the developers. If I can write software in half the time that you can, at half the cost, and with more features, then whose software is more likely to come out on top in the market place? Customers do not care about code purity, they only care about bang for their buck. 2. A good software developer will write simple code to do complex things, NOT complex code to do simple things. This is the basis of the KISS Principle which has been a solid engineering principle for many decades. If you ignore this principle then you may end up with something which looks more like one of those eccentric machines designed by Heath Robinson or Rube Goldberg. I am a pragmatist, not a dogmatist, which means that I am results oriented instead of rules oriented. A dogmatist will follow a set of rules without question and automatically assume that the results, however bad, must be acceptable. A pragmatist will not constrain himself by artificial rules but will instead do whatever is necessary, which may include breaking existing rules and making new ones, in order to produce something which is cheaper, quicker or better. If I can write simple code to achieve a complex task then why should I rewrite it to achieve the same thing in a more complex manner just so that it conforms to your idea of how software should be written? That last item includes my personal experiences which have accumulated over many years while working with numerous teams on numerous projects. If I have encountered an idea in the past that turned out to be bad then no amount of argument will persuade me to try that bad idea again. If I have encountered an idea in the past that turned out to be good I will continue to use that idea unless someone comes up with a better alternative. Simply saying that a new idea is "better" is not good enough. When some so-called "expert" writes an article saying "Don't do it like that, do it like this" I will not jump on the bandwagon until I see absolute proof that the idea is actually better, and only then will I weigh up the costs of changing my code to see if the benefits outweigh the costs. While I am prepared to spend 1p to save £1, I am not prepared to spend £1 to save 1p. Note that the data does not go directly from the input device to the database - it goes through some intermediate software which may process the data in some way before it writes the data to as many tables and columns in the database as necessary. When data is retrieved from the database it may come from several columns in several tables before it is assembled and made ready for display on the output device. Because such systems are designed to do nothing but process data they are known as Data Processing Systems, although the term Data Processing (DP) has subsequently been updated to Information Technology (IT). In the case of the LEO system each of its stores would, at the end of each working day, submit their sales figures showing what quantities of which products had been sold. The software would then accumulate the sales figures from each store to show the total figures for all stores. This information would then enable the company to identify how much of each product needed to be produced overnight, and then how much of each product needed to be despatched to which store in the morning. In those early days the data was input either on punched card or paper tape, and the output was on printed reports. There were no online processes as everything was done in batches. The current figures were not available in real-time as the printed report could only show the state of play as at the end of the previous working day after that day's data had been input and processed. It is a totally different story today. Input via paper tape and punched card has been replaced by input via a Graphical User Interface (GUI) on a monitor using a keyboard and a mouse. In some cases the manual input of data can be automated if the device which records particular events can send its event data directly to the system as and when each event happens. When you go through the checkout in a supermarket, for example, you will be given a receipt which shows the identity, quantity and price of every item you purchased. This data can also be sent directly to the store's central computer, thus avoiding the tedious task of having someone go through all the printed copies of the day's receipts and manually inputting that data. As the central database is being updated in real-time as each event takes place, it also follows that online summaries of that data can also be made available in real-time, making the figures a few minutes old instead of a day old. The use of computer monitors made it easy to replace paper forms or documents with an electronic representation of the same forms into which the user could type data instead of writing it on a piece of paper. Before the internet all forms were compiled and therefore specific to whatever programming language was being used. With the rise of the internet we now have E-commerce where customers use their own personal computers to visit an organisation's website and purchase products without having to visit a physical store. This is done through a web browser which runs on the client (customer's) device, which means that the user interface now consists of nothing but HTML forms which are totally independent of whatever programming language is being used on the organisation's server. I now build database applications for the enterprise in the PHP language, which means that they are web applications and can be accessed from any web-enabled device. Note that these are web applications and are totally different from web sites. My main application, an ERP package, has 300+ database tables, 500+ relationships and 2,500+ user transactions. When analysing the data requirements for a system the database designer must go through a process known as Data Normalisation in order to design a database structure - a series of tables with columns and relationships - which holds all the data required so that it can be both written and retrieved as efficiently as possible. This can be summed up as "A place for everything, and everything in it's place". The design of the database is very important - get it wrong and this will have a detrimental effect on the performance of the entire system. Note that it is not possible to write clever code to circumvent the effects of a bad database design. Abstraction - providing some form of classes and objects. Inheritance - providing the ability to build new abstractions out of existing ones. Runtime polymorphism - providing some form of runtime binding. Encapsulation The act of placing data and the operations that perform on that data in the same class. The class then becomes the 'capsule' or container for the data and operations. Note that this requires ALL the properties and ALL the methods to be placed in the SAME class. Breaking a single class into smaller classes so that the count of methods in any one class does not exceed an arbitrary number is therefore a bad idea as it violates encapsulation and makes the system harder to read and understand. Inheritance The reuse of base classes (superclasses) to form derived classes (subclasses). Methods and properties defined in the superclass are automatically shared by any subclass. Object Oriented programming is supposed to be totally different from Procedural programming, but how different is it in reality? According to the definitions above it could be achieved by taking a procedural language and adding in the ability to support encapsulation, inheritance and polymorphism. This was done when PHP 3 was upgraded to PHP 4. If you take code from a procedural function and put it in a class method you will see that the two pieces of code are exactly the same, and when executed they will produce exactly the same result. The only difference is in how they are called. Cohesion Describes the contents of a module. The degree to which the responsibilities of a single module/component form a meaningful unit. The degree of interaction within a module. Higher cohesion is better. Modules with high cohesion are preferable because high cohesion is associated with desirable traits such as robustness, reliability, reusability, extendability, and understandability whereas low cohesion is associated with undesirable traits such as being difficult to maintain, difficult to test, difficult to reuse, difficult to extend, and even difficult to understand. Cohesion comes from the same root word that "adhesion" comes from. It's a word about sticking. When something adheres to something else (when it's adhesive, in other words) it's a one-sided, external thing: something (like glue) is sticking one thing to another. Things that are cohesive, on the other hand, naturally stick to each other because they are of like kind, or because they fit so well together. Duct tape adheres to things because it's sticky, not because it necessarily has anything in common with them. But two lumps of clay will cohere when you put them together, and matched, well-machined parts sometimes seem to cohere because the fit is so precise. Adhesion is one thing sticking to another; cohesion is a mutual relationship, with two things sticking together. Cohesion is defined as the functional relatedness of the elements of a module. If all the methods on a given object pertain to a related set of operations, the object can be said to have high-cohesion. If an object has a bunch of miscellaneous methods which deal with unrelated concerns, it could be said to have low-cohesion. Cohesion is usually contrasted with coupling. High cohesion often correlates with low coupling, and vice versa. Low Cohesion Low cohesion implies that a given module performs tasks which are not very related to each other and hence can create problems as the module becomes large. Low cohesion in a module is associated with undesirable traits such as being difficult to maintain, test, reuse, and even understand. Low cohesion often correlates with tight coupling. An example of low cohesion can be found at 1-Tier Architecture. Methods carry out related activities by avoiding unrelated sets of data or unrelated operations. While in principle a module can have perfect cohesion by only consisting of a single, atomic element - having a single function, for example - in practice complex tasks are not expressible by a single, simple element. Thus a single-element module has an element that is either too complicated in order to accomplish a task, or is too narrow, and thus tightly coupled to other modules. Thus cohesion is balanced with both unit complexity and coupling. An example of high cohesion can be found at 3-Tier Architecture. Note that this is restricted to when one module calls another, not when one class inherits from another. Coupling is usually contrasted with cohesion. Low coupling often correlates with high cohesion, and vice versa. This term is often interchangeable with dependency. Note that some people like to say that inheritance automatically produces tight coupling between the superclass and the subclass, but this only causes a problem when you extend one concrete class into a different concrete class. As I only ever create a concrete table class from my abstract table class this problem does not arise. Good object-oriented design requires a balance between coupling and inheritance, so when measuring software quality you should focus on non-inheritance coupling. Dependency Dependency, or coupling, is a state in which one object uses a function of another object. It is the degree that one component relies on another to perform its responsibilities. It is the manner and degree of interdependence between software modules; a measure of how closely connected two routines or modules are; the strength of the relationships between modules. Coupling is usually contrasted with cohesion. Low coupling often correlates with high cohesion, and vice versa. Low coupling is often a sign of a well-structured computer system and a good design, and when combined with high cohesion, supports the general goals of high readability and maintainability. High dependency limits code reuse and makes moving components to new projects difficult. Lower dependency is better. You can only say that "module A is dependent on module B" when there is a subroutine call from A to B. In this situation it would be wrong to say that "module B is dependent on module A" because there is no call from B to A. If module B calls module C then B is dependent on C, but it would be wrong to say that A is dependent on C as A does not call C. Module A does not even know that module C exists. Tight coupling arises when Module A can only call Module B, and Module B can only be called by Module A. In this situation there is no scope for reusability. It also arises when a change to one of the modules requires corresponding changes to be made to the other module. Loose coupling arises when any module from Group A can be used with any module from Group B. In this situation the scope for reusability is unlimited. In my framework, for example, any Controller can be used with any Model. It also arises when a change to one of the modules does not require corresponding changes to be made to the other module. In my framework, for example, I can alter the columns in a database table without having to change either the Model or the Controller. The idea that loosely coupled code can be further "improved" by making it completely de-coupled (via Dependency Injection) I consider to be a huge step in the wrong direction. It takes code which would normally exist in a single place and splits it across several places, which makes it harder to read and understand, and therefore harder to maintain. This is not (or should not be) the goal of OOP! I don't use any of the later optional extras for the simple reason that I can achieve what I want to achieve without them. As far as I am concerned any programmer who is incapable of writing cost-effective software using nothing more than encapsulation, inheritance and polymorphism is just that - incapable. Identify each Use Case (user transaction) and provide a UML diagram for each. Class diagrams showing Hierarchies, Dependencies, Associations, Aggregations and Compositions. Identify object interfaces (method signatures) before you write the code to implement that method. Identify suitable Design Patternswhich are to be used in the code. O-R Mapping in order to deal with the differences between the Relational Data Model and the object model. I ignore all of these principles for the simple reason that all they say is "Do it this way!" without explaining why. What problems are these principles meant to solve? If I don't follow these principles what bad thing happen? Reasons such as "to follow best practices" or "to be consistent" or "to be up-to-date" just do not work for me. My programming career started in 1976 on a UNIVAC mainframe where I used some Assembler but mostly COBOL. I later worked on a Data General Eclipse writing business applications using COBOL and the INFOS database (a hierarchical database) and which used character mode terminals. I then moved on to a Hewlett-Packard 3000 to write business applications using COBOL and the IMAGE/TurboIMAGE database (a network database) using block mode terminals. These terminals were all monochrome monitors which had a keyboard but no mouse. When personal computers became available my company switched to the UNIFACE language and used a variety of relational databases. COBOL was a procedural language in which the source code of each program had two distinct parts - a Data Division for all data structures, and a Procedure Division for all code. The two were entirely separate, and it was not possible to mix data and code in the same division. This was a strictly-typed language as you had to define a data item, with its type, in the Data Division before you could reference that data item with code in the Procedure Division. The code would not compile if you tried to insert data of the wrong type into a variable, such as putting a string into a number, or by accessing a variable in the wrong way such as trying to execute an arithmetical function on a string. CS (Conceptual Schema) - which defines all the data items and the relationships between them. This was divided into entities (tables), fields (columns), keys, indexes and relationships. This was also known as the Application Model and was maintained using the Application Model Editor. Each entity and field had a series of triggers which were empty placeholders into which Proc Code (Uniface's procedural language) could be inserted. ES (External Schema) - which provide user views of the data. Each view was built using the Graphical Form Painter (GFP) and provided either a Form or Report Component. Each component could reference any number of entities and fields from the Application Model, and any Proc Code placed into any trigger would be executed either by a mouse or keyboard event. PS (Physical Schema) - was provided as a Database Driver which connected the UNIFACE application with a particular Database Management System (DBMS). It was this driver which used the Application Model to generate the CREATE TABLE scripts for that DBMS, and which generated the SQL queries at runtime to communicate with that DBMS. All that was necessary to switch to a different DBMS at runtime was to change the identity of the Database Driver (or Data Access Object), thus making the application totally database independent. While all COBOL code was lumped together into single units in what was known as the Single Tier Architecture, the fact that UNIFACE had a separate driver for each DBMS turned it into the 2-Tier Architecture. When Uniface 7.2.04 was released it allowed all business rules and database access to be moved out of the Form components into separate Service components, thus providing the 3-Tier Architecture. Communication between the Form components in the Presentation Layer and the service components in the Business Layer was via XML streams, so this caused me to become familiar with XML. Although UNIFACE could also perform XSL Transformations, it could only transform an XML document into another XML document. It could not transform XML into HTML which I thought was a serious mistake as its method of generating HTML was far too clunky and cumbersome. This version also introduced the concept of Component Templates which I later used as the basis for my Transaction Patterns. The majority of my programming work was done while working for software houses, which meant that after designing and building a project for one client I would then move on to another project for another client. To speed up development I created a development framework in COBOL in 1986, which was adopted as the company standard. I later converted this to a development framework in UNIFACE. They were using a new version of the UNIFACE language which had web capabilities bolted on, but in a very clunky and cumbersome manner. The system architects were heavy on theory but light on experience, so what they designed proved very difficult to build. The solution should be designed to match the problem. You cannot take software which was designed to operate the elevators in a tall building and convert it to a database application, nor vice versa. You have to start from new and ignore those aspects which are no longer relevant. In a database application the most important part is the database design. Get this wrong and you are stuffed from the word go. Good databases are designed using the principles of Data Normalisation. Once the database structure has been finalised you should build your software components around this structure. This was emphasised in the Jackson Structured Programming course which I attended in 1979/80. When I applied these ideas my code instantly became easier to understand and therefore easier to maintain. Program code needs to be well-structured, self-documenting (with inline comments), and readable, especially by others, otherwise it will be difficult to maintain even by yourself when you come back to it six months or a year later. Keep It Simple, Stupid. Write simple code to solve complex problems, not complex code to solve simple problems. If it ain't broke, don't fix it. Don't meddle with working code unless you have a genuine problem to solve. Don't Repeat Yourself (DRY). Put duplicated code into a reusable library so that there is only a single copy to maintain. You Aren't Gonna Need It (YAGNI). Concentrate on providing functionality that is definitely needed today, not which might be needed at some time in the future. After learning how HTML pages could be built I decided that UNIFACE was the wrong language for web applications, so I decided to switch to a more appropriate language. I had a brief look at Java, but it looked too much like Fortran to me, so I gave it the elbow. I chose PHP because it was purpose built for the web, I liked the way it looked, I liked that it was dynamically typed, I liked that I could download and install all the relevant open source software onto my PC for free, and I liked that there was oodles of free online documentation and tutorials. After quickly learning how to write scripts which combined SQL with HTML I then learned how easy it was to take SQL output and insert it into an XML document, then transform that document into HTML using XSL stylesheets. It would be based on the 3-Tier Architecture with separate components for the Presentation Layer, Business Layer and Data Access Layer. All HTML output would be generated by transforming XML using XSL stylesheets. The class itself with has a number of methods (operations or functions) which can be called. A separate component which instantiates the class into an object, then calls various methods on that object. Following on from my experience with UNIFACE I decided to put all classes for point #1 in the Business layer, and put all the components for point #2 in the Presentation layer. Why? Because it is the Presentation layer which calls the Business layer, so it is the Presentation layer which instantiates the Business layer component into an object, then calls methods on that object. As PHP was the first language I used with OO capabilities I wanted to find out if I could use those capabilities in my new framework. Having read that OOP consisted of nothing more than Encapsulation, Inheritance and Polymorphism I decided that all the components in my Business layer would be constructed from classes, one for each database table. This followed on from my UNIFACE experience where each component in the Business layer was built around an entity in the Application Model, and each entity and its fields mapped directly to a database table and its columns. This decision - one class for each database table - seemed like a no-brainer to me, so imagine my surprise when I was informed some time later that "proper" OO programmers don't do it that way! I laughed so much the tears ran down my trouser leg! If you look at some of their arguments in Having a separate class for each database table is not good OO you should see the reason for my mirth. A LIST form which shows summary data for multiple rows from a database table, with each record/row from the database being shown on one row in the screen. A SEARCH form which allows the search criteria for the LIST form to be modified before it reads from the database. An ADD form which allows a single new record to be added. An ENQUIRE form which allows all the data for a selected record to be shown in a single screen. An UPDATE form which allows a selected record to be modified. A DELETE form which allows a selected record to be deleted. I have separate forms for each action as it then makes it much easier to allow or disallow access to individual actions for individual users in the security part of my framework. The LIST screen shows data from multiple records where the data for each record goes horizontally across the page with field labels above each column. All the others show the data for a single record in a vertical format, labels on the left and data on the right. The LIST screen is known as the parent as it controls access to its children. The parent can be accessed from a menu button while the children can only be accessed from a navigation button in the parent. The LIST screen has its own LIST stylesheet while all the others - because they the same structure - can share a single DETAIL stylesheet as shown in Figure 3. By having XSL stylesheets which can be shared I am reducing code duplication and increasing maintainability. A table class which could perform the basic CRUD operations on a particular database table. This became the Business layer in the 3-Tier Architecture, and the Model in the MVC design pattern. A script which would receive the HTTP GET and POST requests and then call the relevant methods on the table class. This became the Presentation layer in the 3-Tier Architecture, and the Controller in the MVC design pattern. After looking at the code for several sample applications which could be downloaded from the web I made one important decision that I have never regretted, even though I have been told many times that it is wrong - I decided that instead of having a separate variable for each column in a database table I would have a single $fieldarray variable which would hold the data for any number of columns and any number of rows. This is how SQL works after all, it deals with sets of data and not one column at a time. This meant that I could insert the whole of the HTTP POST array into my table class as a single variable and not have to unpick it into separate columns. This also meant that I could very easily vary the contents of the $fieldarray at will without having to modify any setters or getters. It also simplified the creation of XML documents as my code could simply step through the array using the foreach function in order to identity each column name and its value. I then copied the class for the first table to another class which I then amended to deal with a different database table. This meant that I now had two huge table classes which contained a great deal of duplicated code which is not a good idea in any application. The documented technique in OO to deal with duplicated code between classes is inheritance, so my next step was to create a superclass to contain all the common code so that each table subclass could inherit and thereby share this common code. A very large abstract/super class which contained all the functions that can be performed on an unknown database table, namely Create, Read, Update and Delete. A very small concrete/sub classes for each database table which identified the table name and its structure. where $table_id is passed down by a separate smaller script. I now have one of the small Component scripts for each user transaction while the larger script which does all the work is known as a Controller script, with a separate script for each of my Transaction Patterns. Those of you who are still awake should recognise this as a form of Dependency Injection. Because my Presentation Layer consisted of two separate components it was pointed out that what I had actually done was create an implementation of the Model-View-Controller design pattern. I checked the definition and could see that this was, in fact, quite true. If you look at the description of my three simple scripts you should see that #1 is the Model, #2 is the Controller and #3 is the View. you should see that simply by changing the value of $table_id the same method is being called on a different object. The implementation is different by virtue of the fact that the contents of the $_POST array will be validated against the structure of the specified table, and the SQL query which is generated will be specific to that particular table. My single View object can also be used with any Model as it does not contain any hard-coded references to either table names or column names. The Controller calls the Model, and when the Model has finished the Controller injects that Model object into the View, and all the View has to to is call $fieldarray = $object->getFieldArray(); and it has access to all the application data from that object. By using the foreach function on this array it can obtain the name and value for every data item and insert it into the XML document. This simple decision - by using a single array variable for all object data instead of a separate variable for each individual column - made it possible for me to construct Controllers and Views which do not contain any hard-coded references to any table names or column names. This means that those components can be used on any Model as the methods that they use can work on any Model. This is how to make use of polymorphism. This is how I can produce 2,000 user transactions from 12 XSL stylesheets, 40 Controllers and 300 Models. Does your framework have that level of reusability? If not then why is your framework "correct" and mine "incorrect"? This arrangement was not pure 3-Tier as the code which generated the SQL queries was embedded in the Model (Business layer), so I separated it out and put it into a separate class which, as it exists in the Data Access layer, is known as the Data Access Object (DAO). This was particularly useful when the original mysql_ extension was superseded by the improved mysqli_ extension for accessing MySQL version 4.1 and above. I later added classes to work with other databases, such as PostgreSQL, Oracle and SQL Server. There are some programmers who think that the ability to change databases in an application is rarely needed as, once implemented, it is very rare for an organisation to switch from one DBMS to another, but they are missing one vital point - I do not work on an in-house application for a single organisation, I am a contractor who provides software which can be used by any number of organisations using a DBMS of their choice. They may never switch to another DBMS once the software has been deployed, but they do appreciate having a choice to begin with. Every module or class should have responsibility over a single part of the functionality provided by the software, and that responsibility should be entirely encapsulated by the class. All its services should be narrowly aligned with that responsibility. GUIs change at a very different rate, and for very different reasons, than business rules. Database schemas change for very different reasons, and at very different rates than business rules. Keeping these concerns separate is good design. When I read those statements I can clearly see that he is describing the separation of GUI logic, business logic and database access logic which corresponds EXACTLY with the definition of the 3-Tier Architecture which is precisely what I have implemented. As my software also exhibits the characteristics of having high cohesion I do not think that I can say anything other than "Job Done!" In my first attempt at having a separate class for each database table I included an array called $fieldlist which was a simple list of field names that were contained within that particular table. This meant that when building the SQL query I could ignore entries in the $_POST array which did not belong in that table, such as the SUBMIT button. Then when it came to validating user input I quickly got tired of writing the same code for different columns on different tables, so I sought a much easier method. It was obvious to me that each column had a data type (number, string, date, boolean, et cetera) and that the validation code simply checked that a particular value fell into the bounds of the data type specified for that column. This caused me to convert the $fieldlist array in the $fieldspec array which contained a list of field names as well as their specifications (type, size, et cetera). It then became easy to write a validation class which took the array of field values and the array of field specifications and checked that each field value matched its particular specifications. I then changed the abstract table class so that this validation object was called automatically and did not require any extra coding by the developer. This array is then extracted by the View object so that it can associate each error message with the relevant field when writing to the XML document. The XSL stylesheet will then display each error message underneath the offending value in the HTML output. I have been using this simple mechanism for over a decade now, so why are there still novices out there writing articles like How to validate data which call for large volumes of code in order to obey sets of artificial rules? Those rules don't exist in my universe, so I don't have to obey them, and my code is all the better because of it. It is one thing to provide code libraries which carry out all the basic and standard processing, but there will always be the need in some user transactions to do something which is a little more complicated or a little more specialised. I solved this need by populating my abstract table class with some customisable methods which are called automatically in certain places of the current processing cycle, but which are empty. These "customisable" methods can easily be recognised as they have a "_cm_" prefix. If the developer wishes to add custom code all he has to do is identify the correct method, copy it from the abstract table class to his concrete class, then insert the necessary code. The method that now exists in the concrete table class will now override the empty method in the abstract table class. 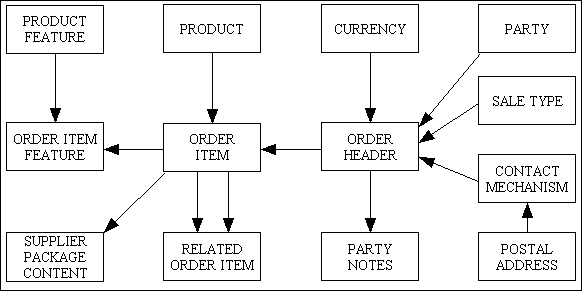 If you look as this collection of UML diagrams you will see what customisable methods are available for each of the major operations and when they are called. When I created my first LIST and DETAIL stylesheets you should notice that they contained hard-coded references to table names and column names. This in effect meant that I had to manually create a separate set of stylesheets for each table. What a bummer! After a bit of experimentation I came up with a method which meant that instead of hard-coding the table and column names in the XSL stylesheet I could actually put those names into the XML document in a separate structure element. In order to define the contents of this element I introduced the use of a separate screen structure file, and modified my View component to read this file and write the data to the XML document. All my other XSL optimisations are documented in Reusable XSL Stylesheets and Templates. This means that I now have a small number of XSL stylesheets which can be used with any database table. I actually have 12 stylesheets which are used with 300 database tables to produce 2,000 different user transactions. How is that for reusability! In my original implementation the $fieldspec array was hard-coded into the relevant table class. This meant that it took some effort to create the class file in the first place, and additional effort should the structure of the database table be subsequently amended. One of the labour-saving devices I had used in my COBOL days was to write a program which read the database schema and produced a text file which could be added to the project's COPY LIBRARY. This meant that every program in the system could use the central COPYLIB definition to obtain a table's structure without the programmer having to code that structure by hand and possibly introducing errors. If a table's structure ever changed it was a simple process to rebuild the COPY LIBRARY then recompile all programs without the need to change any source code. As well as reducing effort it also reduced the possibility for errors caused by incompatibilities between the program's perceived data structure and the actual database structure. The language could only generate CREATE TABLE scripts and not ALTER TABLE scripts should an existing table be modified. This meant that database changes could be cumbersome to implement as the DBA had to write scripts to update the existing tables to bring them in line with the Application Model. As Uniface was a compiled language any changes made to a table's structure could not be recognised by a component unless that component was recompiled against the updated Application Model. If any component was not recompiled it could cause various obscure errors should it be run against a table with a different structure than that which it expected. Instead of maintaining a table's structure in the Dictionary and then sending it to the database I decided to do the opposite - maintain a table's structure in the database and then import that structure into the Dictionary. After the structure had been imported into the Dictionary I could then export that information to a PHP script so that the information was instantly accessible within the table's class file. This is when I decided that I should take this data out of the class file and put it into a separate structure file so that the class file would not be overwritten should it be amended by the developer. The Data Dictionary does not need to generate any CREATE TABLE scripts or ALTER TABLE scripts. All changes are made in the database and then the updated structure is imported into the Dictionary. If I ever change a table's structure I simply rerun the IMPORT process to update the Dictionary data. When I run the EXPORT process for the first time it will create both the class file and the structure file, but after that it will only replace the structure file. Because PHP is not a compiled language I do not have to touch any components that references a changed table. Provided that I have done both the IMPORT and EXPORT processes in the Data Dictionary there is nothing else to do. The only exception to this is when I add or remove a field which then has to be added to or removed from a screen, or if that field has custom code inside the class file. Another advantage to my approach is that once the data is inside the Data Dictionary I can add specifications which are not available in the INFORMATION_SCHEMA such as "change text to upper or lower case", "zero fill", "blank when zero", or even to specify which HTML control is to be used in the output. When maintaining the parent and child relationships I can even specify that when a SELECT statement is being generated the framework should automatically include a JOIN to a foreign table in order to include fields from that foreign table in its output. As part of my Internationalisation feature it is also possible for the framework to automatically adjust the SQL SELECT query to retrieve translated text from the relevant database table without the need for programmer intervention. The contents of the structure file is also database independent. This means that I can generate the scripts from a MySQL database and use the same scripts against an Oracle or SQL Server database. Within the Data Dictionary select a table from an application database. Use screen Generate PHP scripts (a) to select the required transaction pattern. Use screen Generate PHP scripts (b) to enter details which are specific to the selected pattern. The component script which identifies the Model, View and Controller which will be used to perform the necessary function. The screen structure script which identifies the fields which are to be displayed. Some of these transaction patterns are the parent in a family of forms, so this procedure will also generate the child members of the family and add them to the navigation bar of the parent form. This feature now means that starting with nothing more than the schema for an application database it is possible to import that database schema into the Radicore framework then generate all the components necessary to maintain each of those database tables without writing a single line of code. These generated components may be basic in their construction, but they are fully functional. They may be modified afterwards for cosmetic reasons, or to add in additional business rules. Once generated these files cannot be regenerated, so any modifications cannot be accidentally overwritten. It is also important to note that the amount of code which is generated is very small, and not the huge volumes produced by other frameworks. This is because all the code for standard and basic behaviour exists as reusable modules within the framework, and these small scripts merely act as pointers to which of those modules should be used and in what order. I learned to design and build database applications - which included designing the database as well as writing the code to access that database - decades before I used a language with OO capabilities. During that time I learned that software solutions in general should be designed to reflect the problem which is being solved, so for database applications this meant writing code which acted as the intermediary between the User Interface (UI) and the database as shown in Figure 1. I also learned that the database should be designed first using a methodology known as Data Normalisation, and, thanks to Jackson Structured Programming (JSP), that the software should be designed around the database structure. My experiences both before and after JSP convinced me of the efficacy of this statement, so I absolutely WILL NOT go back to a methodology which puts the software design ahead of the database design. There are some people who say that PHP is not a "proper" OO language, but according to the man who invented the term they are wrong. These people insist that "proper" OO requires more than that, and although new OO features have been added to PHP version 5 I consider them to be nothing more than optional extras and choose to ignore them. They would not add value to my code, so I do not have any use for them. If I have written code that works then I prefer to follow the engineering principle which states If it ain't broke, don't fix it. Thus I will not tinker with working code just to make it work differently, but I would be prepared to refactor it to make it work better. I implemented Encapsulation by creating a separate class for each database table. This became the Business layer in the 3-Tier Architecture or the Model in the Model-View-Controller. I implemented Inheritance by modifying each concrete table class so that it inherited common code from an abstract table class. This left me with a large abstract class and very small concrete classes. I implemented Polymorphism by having each Controller call methods on the Model which were defined in the abstract table class, thus making it possible for each Controller to be used with any Model in my application. 12 reusable XSL stylesheets which are used to produce all the HTML output screens. 1 View module which extracts data from the Model(s), writes it to an XML file, then transforms it into HTML using an XSL stylesheet. 1 module for producing CSV output. 1 module for producing PDF output. 40 Controllers which perform specific actions on unknown Model classes. 1 Data Access Object to generate the SQL queries for the RDBMS, with separate versions for MySQL, PostgreSQL, Oracle and SQL Server. Each new version of my framework has enabled me to be more productive than I was with the previous version - What I could achieve in a week with my COBOL framework I could achieve in a day with my UNIFACE framework, but with my new PHP framework it only takes me 5 minutes. I have also achieved the objectives of OO by having increased code reuse and decreased code maintenance, so as far as I am concerned my efforts have been a resounding success. So when someone tells me that I have failed simply because they don't like the way that I have achieved my results you must excuse me if I consider that person to be a candidate for the funny farm. Had I come to learn about OOD and OOP without any prior experience with database applications, and had I been taught all that wild OOD theory then in all probability I would not have achieved the same level of success, not by a long chalk. This just tells me that OOD is either completely wrong, or just incompatible with database applications. If this is the case then surely it is a strong argument for giving OOD the elbow and sticking to the design methodology that is simpler and more reliable? The big selling point of OOP is supposed to be that it gives you the ability to model the real world, but you have to be careful about which parts you model and how you model them. You do not need to model the whole of the real world, just those parts with which you wish to interface or interact. 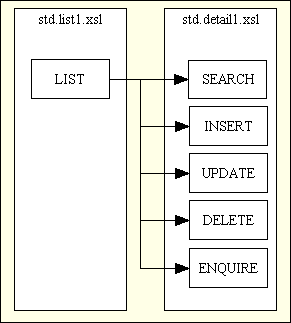 When it comes to writing database applications you have to realise that, as shown in Figure 4, you are not interacting with real world objects or entities at all, you are in reality only interacting with information about those real world objects, and that information exists as tables and columns in a relational database as shown in Figure 5. As we are not interacting with real world objects it should be obvious that the operations which can be performed on a real world object then become totally irrelevant. We are only interacting with tables in a database, and guess what are the only operations which can be performed on a database table? Nothing more than Create, Read, Update and Delete. It does not matter how many tables you have in a database, or what information they hold, they are all manipulated using the same four operations. It is also important to note that during the process of Data Normalisation the data for a real world object may need to be split across more than one table. 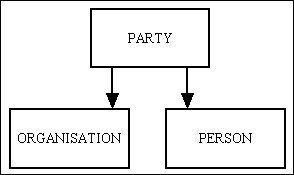 Although these tables should be related in some way so that they may be joined together to produce a single set of data, it should be noted that each table can still be treated as a separate entity in its own right and can be accessed using the same CRUD operations as every other table. A table may have another table as its parent and at the same time have a third table as its child. Each parent may have parents of its own, and each child may have children of its own, but that does not matter. When an SQL query is created for a table the table may be examined on its own, or it may be JOINed with any number of other tables. In other words, the existence of a relationship does not place any restrictions on how a table may be accessed. A SELECT query may reference any number of tables, but an INSERT, UPDATE or DELETE query will only work on one table at a time. Figure 6 shows an Entity Relationship Diagram (ERD) from part of my ERP application. This contains a dozen or so tables which are all related in one way or another. Despite the number and complexity of these relationships each of these tables can still be treated as a stand-alone entity and accessed in the same way as every other table in the database. Unlike OO theory where a has-a relationship is used as a reason to employ Object Composition to create a complex object, in relational theory there is no such thing as a complex table - a table is a table irrespective of how many relationships it may or may not have. For example, an ORDER_HEADER has ORDER_ITEMs, so in OO theory the ORDER_ITEM object is created as part of the ORDER_HEADER object and can only be accessed by going through the ORDER_HEADER object. No such situation exists in relational theory. 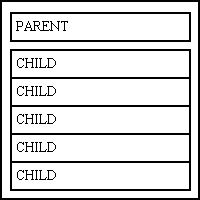 Just because a table exists as the child in a parent-child relationship does not mean that I have to go through the parent to get to the child - I can reference the child as if it were a stand-alone entity without any relationships, or I can reference several related tables in the same query by incorporating one or more JOIN clauses. Note also that the ORDER_ITEM table actually has two parents - ORDER_HEADER and PRODUCT - so in which of those two composite objects should it be included? If you say one then you will make it difficult to access it through the other. If you say both then you will be guilty of duplication. As relational databases do not support composite objects they have neither of these problems. Using my framework I can build the same family of forms for every one of those tables in figure 6, and they would be perfectly usable transactions. Although these would the simplest and most basic of transactions, they would all share the same 6 Controller scripts, the same single View object for all HTML output, and the same 2 reusable XSL stylesheets. For more complex transactions I have created a library of Transaction Patterns. I have created an ERP application which contains over 2,500 transactions from this set of patterns, so I am not making false claims. Persistence is the ability of an object to survive the lifetime of the process in which it resides. This allows the object's state to be retained between its deactivation and subsequent re-activation. They therefore expect the persistence mechanism to store and load their complex objects without having to bother with such things as tables and columns. They treat the whole idea of persistence as being nothing more than a mere implementation detail that can be left until last as it should have no effect on how the system is designed. What they want is an Object Oriented Database (OODBMS) instead of a Relational Database (RDBMS). Various organisations have written articles on how object state should be persisted, but nobody has yet invented something that is good enough to take the place of the relational database. Unfortunately OO databases, while being great in theory, have not proved to be so great in practice, so are only used in small niche markets. When programmers complain that relational databases are not Object Oriented I have to answer with "It depends on your definition of OO". Considering that Nobody Agrees On What OO Is and nobody can agree on what makes a language OO or not, it can be said (and I'm just about to say it) that relational databases do actually share some of the major concepts of OO theory, but they simply implement them in a slightly different way. In the following paragraphs I will examine several of these major concepts one by one and show you what I mean. I disagree. In this definition it says that a class is a blueprint or prototype from which objects are created. If you look at the Data Definition Language (DDL), the CREATE TABLE script, for a database table you should see that this acts as a blueprint for every record that will be written to that table. So if they are both blueprints then they both serve the same purpose but in a different way. I disagree. In OOP an object is an instance of a class, and in a database a record in a table is an instance of that table's DDL. So they are both instances of their respective classes or blueprints. I disagree. If you look at this description of Encapsulation you will see that it is nothing more than the act of placing data and the operations that perform on that data in the same class. I have already shown that databases do in fact have their equivalent to classes but what about the operations? A competent programmer will immediately tell you that you never have to specify the operations that can be performed on individual tables as every table is automatically subject to the same operations - Create, Read, Update and Delete. Note that a superclass can be shared by more than one subclass, and a subclass can have subclasses of its own. This may also be known as a One-to-Many relationship as an instance of the Parent (One) can be related to more than one instance of the Child (Many). With this design the introduction of a new type of dog requires no more effort than adding a record to the DOG_TYPE table. There are no changes required to the software, no new classes, no new screens, no new database tables, no nothing. From a programmer's point of view this simple 2-table structure is far easier to deal with than an unknown number of classes. You should therefore be able to see that although the mechanisms are different the results are the same. and insert any value for <tablename> and that operation will produce different results. That meets the definition of polymorphism does it not? I disagree. The definition of dependency is nothing more than the basic relationship among objects, and a relational database was specifically designed to handle the relationships between tables by using a foreign key on a child table to link back to the primary key of its parent table. I disagree. The definition of association is nothing more than a link between any number of classes. Relational databases support any number of these links or relationships between tables. While a foreign key is used to link a single child table to a single parent table, a parent table can have more than one child just as a child table can have more than one parent. A parent table can have parents of its own just as a child table can have children of its own. These "associations" are bi-directional as you can start at any point in the table hierarchy and move in any direction, either up or down, simply by constructing whatever SQL query will satisfy your needs. I disagree. The definition of aggregation is nothing more than an association (relationship) between no more than two classes. As a foreign key will establish a relationship between two tables this is therefore covered. Irrelevant. The definition of composition describes this as an instance of a container class which contains instances of one or more contained classes as a result of there being a "has-a" relationship between two classes. In a relational database each table is defined as a separate table in its own right and can be accessed without the need to refer to any related tables. Although it is possible to construct an SQL query which can produce a result set which combines data from several tables, all INSERT, UPDATE and DELETE queries can only operate on one table at a time. In the following sections I will refer to two database tables called PARENT and CHILD which are in a one-to-many relationship where PARENT is the "one" and CHILD is the "many". After those 10 rows have been retrieved from the database it is then necessary to iterate through those rows and issue another query to retrieve data from the PARENT table for the current row. This "solution" will therefore require one query to access the CHILD table and ten queries to access the PARENT, so for 10 rows it will require 10+1 queries. This is why it is known as the "N+1" problem. // Retrieve data from foreign (parent) tables. 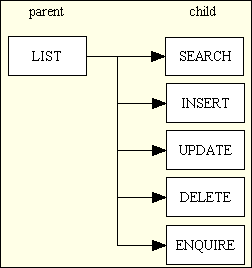 Although it is possible to manually adjust the query which is generated by placing the relevant code in the _cm_pre_getData() method, it is also possible to get the framework to automatically adjust the query by specifying which columns should be retrieved from which foreign tables using the mechanism described in Using Parent Relations to construct sql JOINs. It requires the construction of a composite object to deal with more than one table. This requires far more effort than the auto-generation of a separate class for each table. It requires separate custom methods to perform actions on each of the tables which it handles. Custom methods on the Model will therefore require custom Controllers to call those custom methods. By using custom methods instead of generic methods there is a loss in reusability due to a loss in polymorphism. If you are awake you should notice that I can have multiple copies of this script where each copy can specify different values for $outer_table and $inner_table, but the contents of std.list2.inc will remain unchanged. This means that I can use the std.list2.inc Controller with ANY combination of tables in the database (provided that they are related, of course). THAT is a prime example of reusability through polymorphism, and a prime example of what is lost by using custom methods in your Models which in turn requires custom controllers to call those custom methods. // perform custom processing after database record has been inserted. Note that it is not necessary to filter the contents of $fieldarray before it is passed to the new object as all filtering and validation will be handled inside the object. It is not necessary to specify any columns by name, either for the primary table or the secondary table, as all column names and their associated values are contained within $fieldarray. If any errors are generated the entire operation will be abandoned which will include a rollback to undo any updates which have happened so far in the current task. It is possible for this method to perform any number of operations on any number of table objects, and it is possible for these secondary objects to have additional processing of their own. There is no such thing as a single way to write cost-effective software which is easy to read, easy to understand and easy to maintain. What some people try to promote as the "one true way" I have learned to avoid like the plague as the results simply do not measure up. I have mentioned some of these questionable practices in the preceding paragraphs, and below I present a summary for your amusement and edification. The software should always be structured around the database, not the other way around, so once the database has been designed there should be no need to design how the software should interact with the database. Irrespective of what data is being stored, each database consists of nothing but tables and columns which have predefined properties, and SQL only has four operations that can be performed on tables - Create, Read, Update and Delete. Because you do not use two different design methodologies which produce incompatible designs you will not have the problem known as Object-Relational Impedance Mismatch and will not need that abomination of a solution known as an Object Relational Mapper (ORM). By having a separate class for each database table it becomes possible to generate your class files automatically from the database structure, thus saving development effort. Each table class then encapsulates the properties and operations of its designated table. By recognising the fact that a great deal of code for accessing a database table is common across all tables, it becomes possible to put all that common code into an abstract table class and share that code through inheritance. By having the structure of each database table available to its class it then becomes easier to keep each class synchronised with its corresponding table. By recognising the fact that once you have written a Controller which communicates with a Model to perform an operation on a database table, it then becomes possible to code that Controller in such a way that it can perform the same operation on any database table. This makes the Controller reusable by implementing polymorphism. By recognising that you can categorise each user transaction into a particular Transaction Pattern it then becomes possible to generate user transactions simply by pairing a particular Transaction Pattern with a particular database table, thus saving even more development effort. All the above would be greatly hampered if you did not have access to a development framework which was specifically designed to help build and then run database applications. Fortunately I do because I wrote it. Many application developers tend to treat relational databases as a storage mechanism that is best hidden away. Frameworks exist who tout the advantages of shielding application developers from the complexities of SQL. I often hear people complain that they are forced to compromise their object model to make it more relational in order to please the ORM. Actually I think this is an inevitable consequence of using a relational database - you either have to make your in-memory model more relational, or you complicate your mapping code. I think it's perfectly reasonable to have a more relational domain model in order to simplify [or even eliminate] your object-relational mapping. To use a relational model in memory basically means programming in terms of relations, right the way through your application. In many ways this is what the 90's CRUD tools gave you. They work very well for applications where you're just pushing data to the screen and back, or for applications where your logic is well expressed in terms of SQL queries. Some problems are well suited for this approach, so if you can do this, you should. So if Martin Fowler says that it's OK to use a relational model in memory and so avoid having to use a complicated mapper then who are you to argue? This article has described a non-mainstream solution for database programming. The solution resembles database programming before the object-oriented era. But there is one big difference: it utilizes the full power of the object-oriented programming language. There does not need to be any impedance mismatch between the use of a relational database and an object-oriented programming language. The table-oriented programming model allows the application source code to be aware of the actual database structure instead of hiding it in a mapping layer deep in the application stack. Many enterprise applications have a lot of CRUD-related (create, read, update, delete) logic, and developing CRUD functionality is much simpler if the database structure is not hidden. Nowadays it's a quite common approach to have models that essentially just represent database tables. Although there are technical differences between our two implementations - such as the fact that I don't have a separate DAO for each table, and I don't have a separate class property for each table column - the underlying concept is the same. Every entity "is-a" database table, therefore every entity class can inherit from an abstract table class. The concept of a table is abstract. A given SQL table is not, it's an object in the world. My abstract table class contains a large amount of code that can be applied to any database table, while each concrete class is for a specific database table. Most designers overuse inheritance, resulting in large inheritance hierarchies that can become hard to deal with. So I am doing what he suggests - avoiding large inheritance hierarchies and only inheriting from an abstract class. There may be other types of relationship which in OOD are shown as something like Figure 10, but which in the database can more easily be shown as something like Figure 11. 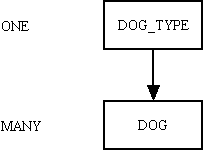 The big difference is that with OOD you would have to create a new class for each new type of dog, and new controllers to communicate with that class, whereas in a database all you have to do is add a new entry to the DOG_TYPE table without the need for any code changes. When you are writing a database application you should know how a database works and should structure your code accordingly. Doing anything else is a recipe for disaster. has-a is a composition relationship where one object (often called the constituted object, or part/constituent/member object) "belongs to" (is part or member of) another object (called the composite type), and behaves according to the rules of ownership. In simple words, has-a relationship in an object is called a member field of an object. Each class represents an entity by encapsulating its properties and methods. Where that entity is a database table the "properties" are its columns and the "methods" are always Create, Read, Update and Delete. However, following the rules of Data Normalisation if the data for an entity becomes too complex it may need to be split off into separate tables. For example, if an entity has repeating groups then in order to pass through 1st Normal Form that repeating group needs to be be moved to a separate table. This is why, in Figure 6 the ORDER_HEADER table is the parent of the ORDER_ITEM table. By following the rules of OOD just because ORDER_ITEM exists in a "has-a" or "belongs-to" relationship with ORDER_HEADER then the ORDER_ITEM class belongs in the ORDER_HEADER class and can only be accessed through the ORDER_HEADER class. Have a LIST 1 pattern with the ORDER_ITEM table on its own. Have a LIST 2 pattern with ORDER_ITEM as the child and ORDER_HEADER as the parent. Have a LIST 2 pattern with ORDER_ITEM as the child and PRODUCT as the parent. It is just as easy to refer to an individual column with $this->fieldarray['fieldname'] as it is with $this->fieldname, so nothing is lost. When the DAO passes data back to the Model there is no need for code which references column names individually, which makes the code reusable across all tables instead of specific to a single table. The simple mechanism of passing data around in a single $fieldarray instead of column by column has a very useful side-effect in that the $fieldarray can sometimes contain data for columns which do not actually exist on that table (such as through SQL JOINs), or sometimes have columns missing. When passing data between objects in a single $fieldarray variable the passing mechanism never has to know the contents of the array, so does not have to deal with extra or missing columns. Objects should just be bags of state and nothing more. An invoice does not pay itself. An appointment does not reschedule itself. invoice.pay(anAmount) and appointment.reschedule(aDate) do not match the real world. Something on the outside drives the action. A service of some kind should do the paying and the rescheduling, and then update the state of those objects: invoice.setPaidAmount(anAmount) and appointment.setDate(aDate). By consequence, not in the objects, but the services should contain the business logic. Of course invoices do not pay themselves, but that's not what an object model is trying to do. An invoice exposes the behaviour of being able to be paid. That ability is in fact essential to what it means to be an invoice. The behaviour is an inherent property of an invoice. If an invoice doesn't have the ability of being paid, there's no point in issuing invoices at all. In other words, the contract of an invoice object declares that its interface includes payment as a feature. Its promise to the outside world is that it allows an outsider to pay for it. Encapsulation of state and behaviour is the core idea behind objects. I disagree with both of these opinions for the simple reason that they both require specific methods to be inserted into the class, and this in turn requires the controller which calls that object to be coded with those specific methods. By doing this you have instantly removed any reusability from that controller as it can only be used on an object which contains those methods. By using specific methods instead of generic methods you have disabled any opportunity for reuse via polymorphism. How is it possible to achieve these results without using specialised methods? You have to remember that in a database application the entities called INVOICE and APPOINTMENT are both database tables, and the only operations that can be performed on a database table are Create, Read, Update and Delete. In my framework these operations are built into my abstract table class which is inherited by every concrete table (Model) class. Every one of my 40 page controllers communicates with its Model by using these generic methods, which means that every one of those page controllers is capable of being used with any of my 300+ table classes. Thus by opening up the door to polymorphism I have created a huge amount of reusable code, and as this is supposed to be one of the objectives of OOP it must be a good idea. How is it possible to perform these operations by calling generic methods? You should realise that in an application each use case is implemented as a user transaction (task) which can be selected from a menu. Each task consists of a Controller which calls a Model which in turn calls a DAO to update the database. So for each use case you need to identify exactly what database operations are needed to achieve the desired result. Add a record to the PAYMENT table. Update the INVOICE record with the new balance. // perform custom processing before database record is updated. Notice that I do not bother with a special updateBalance() method as I want the balance to be automatically updated in every update operation, and this can be done with the generic updateRecord() method. In order to implement the use case "reschedule an appointment" this could be as simple as updating the appointment_date column on the APPOINTMENT table, in which case all you need to do is create a task which combines the standard UPDATE 1 pattern and the APPOINTMENT table. Note that this will allow any column except for the primary key to be updated. Use the generic insertRecord() method on the Customer, Product or Invoice object. Use the generic getData() method on the Customer, Product or Invoice object. Use the generic updateRecord() method on the Customer, Product or Invoice object. Use the generic deleteRecord() method on the Customer, Product or Invoice object. Not only can those same methods be used on those 3 table classes, they can be used used on any of the 300 classes in my application. By working with the fact that I am updating a relational database, and breaking down each use case into specific database operations, I am able to perform each of those operations with a combination of pre-written and reusable generic code plus the addition of custom code in the relevant custom methods. This achieves the necessary results, but with far less effort, so how can it possibly be wrong? By using a single $where argument it is therefore possible to specify anything which the database will accept, and because it is a simple string it is easy to view and modify its contents. In software engineering, a design pattern is a general reusable solution to a commonly occurring problem within a given context in software design. A design pattern is not a finished design that can be transformed directly into source or machine code. It is a description or template for how to solve a problem that can be used in many different situations. Patterns are formalized best practices that the programmer must implement themselves in the application. In software engineering, duplication of something is often considered a sign that more abstraction or factoring is needed. Duplication should generally be refactored into one or fewer spots to simplify the code and localize changes to one or fewer spots. In other words, why do patterns have to be duplicated instead of just referenced for each usage? Do GOF patterns represent unnecessary duplication? One comment I saw in a news group just after patterns started to become more popular was someone claiming that in a particular program they tried to use all 23 GoF patterns. They said they had failed, because they were only able to use 20. They hoped the client would call them again to come back again so maybe they could squeeze in the other 3. Trying to use all the patterns is a bad thing, because you will end up with synthetic designs - speculative designs that have flexibility that no one needs. These days software is too complex. We can't afford to speculate what else it should do. We need to really focus on what it needs. That's why I like refactoring to patterns. People should learn that when they have a particular kind of problem or code smell, as people call it these days, they can go to their patterns toolbox to find a solution. Design patterns should not be applied indiscriminately. Often they achieve flexibility and variability by introducing additional levels of indirection, and that can complicate a design and/or cost you some performance. A design pattern should only be applied when the flexibility it affords is actually needed. The best use of design patterns occurs when a developer applies them naturally based on experience when need is observed rather than forcing their use. Another problem I have found with too many programmers is that they fail to realise that each design pattern is only supposed to provide benefits in a particular situation, or to be a particular solution to a particular problem, and if that situation does not exist in your code then implementing that solution may not provide any benefits at all. On the contrary, it may actually provide negative benefits in the form of unnecessary code which is hard to read and therefore hard to understand and maintain. This does not stop these numpties from using certain design patterns at every opportunity instead of only when the circumstances are appropriate. A typical case is with Dependency Injection: despite me saying that this technique should only be used when appropriate, there are numpties out there who do not understand what "appropriate" means and who insist that it should automatically be used for every dependency regardless of the circumstances. My problem with patterns is that there seems to be a central lie at the core of the concept: The idea that if you can somehow categorize the code experts write, then anyone can write expert code by just recognizing and mechanically applying the categories. That sounds great to managers, as expert software designers are relatively rare. The problem is that it isn't true. The truth is that you can't write expert-quality code with "design patterns" any more than you can design your own professional fashion designer-quality clothing using only sewing patterns. I do not use design patterns. By that I mean that I do not read about them then try to implement them. I simply write code that works, and if a pattern appears in my code then it's more by luck than by design, a mere coincidence. When I rewrote my development framework in PHP one of my first objectives was to implement the 3-Tier Architecture which I had encountered in my previous language. I had personally witnessed the advantages of this architecture over its earlier 1-Tier and 2-Tier alternatives, so I did not need to be told by some self-styled guru that it was a good idea. 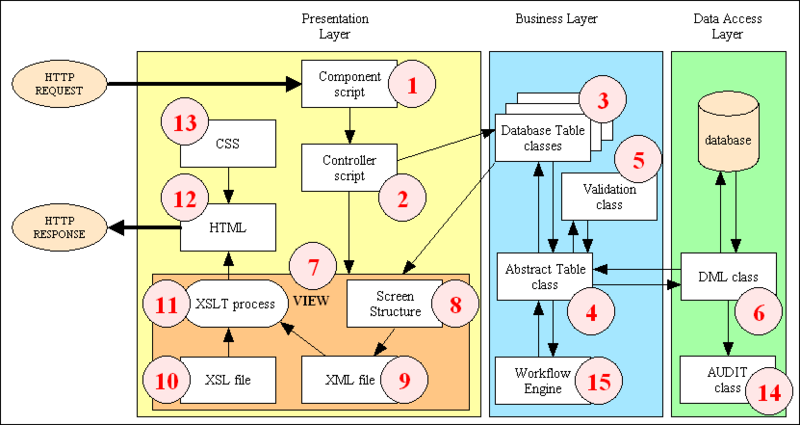 It was not until several years later when a colleague pointed out to me that because I had split my Presentation layer into two separate parts which matched the description of the View and the Controller, with the Business layer playing the part of the Model, that I had also implemented the Model-View-Controller design pattern. When I published an article on what I had done I was immediately told that my implementation was wrong, but I didn't care. The only design pattern that I have ever read about and then implemented is the Singleton pattern, but being a heretic my implementation is totally different to everyone else's and therefore wrong. Do I care? Not one iota. My implementation does not have the problems reported by others, so I do not consider it to be in the slightest bit evil at all. I prefer to use Transaction Patterns instead of design patterns for the simple reason that they give me access to pre-coded designs which I can quickly turn into runnable components simply by saying "Match this Transaction Pattern with that database table" without the need to write any code. These are genuine reusable patterns, not simply descriptions of patterns, as I don't have to write a fresh implementation each time I want to use one. What is a "single responsibility"? How do you know when a component has too many responsibilities and needs to be split into smaller components? How do you know when to stop splitting? Despite Robert C. Martin clearly stating that the three areas of "responsibility" or "concern" which should be separated are GUI logic, business logic and database logic, there are far too many programmers who continue the separation process to ridiculous extremes. My framework is split into 3 separate layers, and that provides all the separation I need, so I see no justification in splitting it further. This principle does not properly identify what problem(s) it is trying to solve, and as far as I can see all it does is introduce new problems. It is therefore less problematic to ignore this principle completely. This entire principle is irrelevant if you only inherit from an abstract class, as I do in my framework. This principle is only relevant if you use the keywords "interface" and "implements". These keywords are both optional and unnecessary in the PHP language, and as I choose not to use them in my framework this principle is consequently completely irrelevant. In the first place the common description of this principle, which is "High-level modules should not depend on low-level modules. Both should depend on abstractions. Abstractions should not depend on details. Details should depend on abstractions." is, in my humble opinion, total garbage. In the second place the author of this principle gives an example in the "Copy" program where its application would be appropriate and provide genuine benefits, but far too many programmers insist on applying this principle in all circumstances whether they are appropriate or not. I have found a place in my framework where I can actually make use of DI, but in those places where it is not appropriate I do not use DI at all. This is often stated as "favour composition over inheritance" and is intended to deal with those situations where the over use of inheritance causes problems. As I do not have deep hierarchies, only ever inheriting from a single abstract class, I do not have this problem which means that I don't need this solution. There is a very old proverb which states The Proof of the Pudding is in the Eating which roughly means that it does not matter how much effort went into either creating or following the recipe, it is how the final product tastes that matters. It does not matter to me how much effort has been put into modern OO theory, or how many articles and books have been written to show how this theory can be put into practice. I consider the latest theories to be seriously flawed in that they may be fine in theory but they do not measure up in practice. I also consider that most of the implementations of these theories are flawed, so by putting the two together this means that all the flawed implementations of those flawed theories are doubly flawed. How can I say this? Simple. By ignoring all these flawed theories and using my own experience and common sense I have come up with a method which produces cost effective software with far less effort, lower costs, shorter timescales and more features than my rivals, and which customers are willing to buy. That last point is the most important. I write software to impress my customers, NOT to impress other developers with the purity of my design and implementation. I do not follow their artificial rules simply because I can achieve superior results by ignoring those rules. If those rules are supposed to encourage the building of good software then I'm afraid they have failed - unless in your world you spell the word "good" with the letters "C", "R", "A" and "P". By continuing to follow my own approach and ignoring the "advice" of my critics I have managed to create a development framework which enables me to build database applications at a faster rate than any of the rival frameworks. When I say "faster" I mean that, starting with nothing more that a table's schema in the database, I can import that table's structure into the Data Dictionary, run the EXPORT process it to create the class file, then generate the scripts for the family of forms within 5 minutes and then run them without the need to write a single line of code - no PHP, no HTML and no SQL. The Data Dictionary is used to create application components while the RBAC system is used to run those components. The Audit Logging system is used to both record and view all changes made to the database while the Workflow system can be used to automatically start a second task when the first task has been completed. Some people tell me that by not following their rules that my code must automatically become an unmaintainable pile of poo, but they could not be more wrong. If you examine the levels of reusability that I have achieved you should see that all the standard behaviour is covered by code within the abstract table class, the page controllers and the View objects. These are all reusable components which are part of the framework and do not have to be written or modified by any developer. All application Model classes only need contain additions to the standard functionality which means that I can make changes to the standard functionality without having to make any changes to any application classes. In this way those prototype applications which I released a decade ago will still run in the latest version of the framework and will automatically include any enhancements (except where new features require new code). It is important to note that this framework cannot be used to build public-facing web sites, it is only for business-facing web applications. If you do not understand the difference then I suggest you read Web Site vs Web Application. If you can count you should realise that that averages out at one database/subsystem per calendar month. I honestly do not believe that I could have achieved that level of productivity if I had used a "proper" design methodology. One important aspect of selling a software package which can be used by multiple organisations is that each of those organisations will be bound to have their own specialised requirements in certain areas which means that the standard code will not be sufficient. In order to cater for this common requirement I have designed a mechanism whereby any customisations required by individual customers can be maintained as separate plug-in modules. These plug-ins are held in separate directories from the standard code, with separate subdirectories for each customer. At runtime the framework will look for plug-ins for the current customer, and if any are found they will be processed automatically. This software currently deals with 300+ database tables, 500+ relationships and 2,500+ user transactions, so it cannot be described as a "trivial" application by any stretch of the imagination. It is suitable for world-wide consumption as it is multi-lingual, multi-currency, multi-timezone and multi-calendar. In 2014 I met the chairman and president of Geoprise Technologies Corporation who build and market software in America, Asia and the Pacific Rim. His company had already used my framework to build their own applications, so I showed him my TRANSIX software and asked if it had any value to him. He was impressed enough to offer me a Joint Venture Partnership and make me Director, Research and Development. Shortly after that we won a contract to supply software to a major aerospace company in Singapore. None of this would have been possible if my software was as bad as my critics would have you believe. Ask somebody in the building industry to visually communicate the architecture of a building and you'll likely be presented with site plans, floor plans, elevation views, cross-section views and detail drawings. In contrast, ask a software developer to communicate the software architecture of a software system using diagrams and you'll likely get a confused mess of boxes and lines. I've asked thousands of software developers to do just this over the past decade and continue to do so today. The results still surprise me, with the thousands of photos taken during these software architecture sketching workshops suggesting that effective visual communication of software architecture is a skill that's sorely lacking in the software development industry. Note that in the above diagram each of the numbered components is a clickable link. If you cannot produce such a simple yet comprehensive diagram of your application architecture then perhaps it just proves that your architecture is a total mess to begin with. Or perhaps it points to the fact that I have artistic abilities (some people refer to me as a Piss Artist) which, coupled with my logical mind, makes me a better designer/builder than most of my contemporaries. If not actually better then less incompetent. By following the KISS Principle I write simple code to do complex things, not complex code to do simple things. Each time a new feature is added to the language I do not jump on the bandwagon and look for ways to squeeze it into my code. If I have already got code that works then I don't change it to incorporate a new feature unless that new feature provides measurable benefits, such as being able to replace a large block of code with something significantly smaller. The end result of not using any fancy new features, or not using them in a fancy way, was that whenever a new version of PHP was released I could simply install it and my code would run. I did not have to waste time looking for BC breaks or where a recently added feature had changed, and none of my users had to download a separate version of my framework which was compatible with a particular version of the language. That is why my framework is still capable of being run on any version of PHP, including version 4. I do not plan to officially drop support for PHP 4 until I start supporting PHP 7 as the differences cannot be contained in a single place. I then researched how I could implement Encapsulation, Polymorphism, and Inheritance with PHP, and using my 20+ years of previous experience in writing database applications I was quickly up and running. Not only did my first attempt prove eminently workable, subsequent refactoring enabled me to become more productive than ever when building database applications, and I released my development framework as open source in 2006 so that others could benefit from my work. The fact that OOD/OOP enables you to model the real world is irrelevant unless you are writing software which interacts directly with objects or entities in the real world. If you are writing software which interacts with tables in a database then you should tailor your solution to deal ONLY with the properties and methods which apply to tables in a database. This is why every one of my Model classes in the Business layer is built around a single database table. Yet as soon as I wrote an article explaining this simple concept I was told most emphatically that Having a separate class for each database table is not good OO. is also wrong. There is absolutely no reason why it should be more complicated than that. Anyone who says otherwise must be a member of the let's-make-it-more-complicated-than-it-really-is-just-to-prove-how-clever-we-are brigade. On the contrary, I maintain that by following the KISS Principle (which is often replaced with Do the Simplest Thing that Could Possibly Work) then my solution, being simpler, is automatically superior. Another problem I have with today's OO theory is that it is being taught as the only way to implement OO "properly". I have never seen any articles saying "it could be done either this way or that way", just "it should be done this way". Anyone who deviates from the official view is immediately branded as a heretic or a dunce - just take a look at What is/is not considered to be good OO programming and Your code is crap! if you don't believe me. The new generation of programmers is not being taught to think for themselves, they are taught merely to obey! As far as I am concerned there is no such thing as "only one way" to do anything. In my COBOL days there were many different attempts by different authors to define a "better" design methodology or "better" development standards, and while some developers chose to pick one of these methodologies (or had the choice imposed upon them by management) and adopt it 100% to the exclusion of all others, I and my colleagues decided on the pick'n'mix approach were we took the bits that we liked from a number of different methodologies and combined them with bits of our own invention in order to come up with something that we liked and which worked for us. It may have resulted in a patchwork quilt of ideas, but it worked for us, and that is the only fact worth considering. The same thing can be said for any of today's OO techniques. Just swap the words "technical primary keys" for any aspect of OOD or OOP and you will come across a large number of people who fall into the "indiscriminate" camp and who therefore show a lack of intelligence. By insisting that there is only "one true way" the teachers of the next generation are doing that generation a great disservice. By adopting a closed mind attitude which is akin to religious dogma they are preventing the next generation from exploring all the available options and perhaps coming up with new and better options. Progress, after all, can only be achieved by doing something which is different. If you are forced to be the same as everyone just to conform or to be consistent, then you will always be a drone and not an individual. You will always be a sheep and not a shepherd. You will always be a code monkey and not an organ grinder. I am not a dogmatic programmer who is rules-oriented, I am a pragmatic programmer who is results-oriented. I don't follow the herd, I am a maverick. I do not follow the orthodox view without question, I am a heretic. I do not engage in Buzzword Driven Development or Cargo Cult Programming. Rather than being one to Jump on the Bandwagon I prefer to Dump on the Bandwagon. I don't write code to please other programmers, I write code to please my paying customers, and all the while I have customers knocking on my door I shall continue doing what I do and laugh all the way to bank while you are finding more and more complex and ridiculous ways to do such simple things.